In the late 80s, I had a small obsession with very tactile clothing. This was the era of Madonna, of John Hughes, of puffy paint, of crazy neons, of ice cream rolling your socks, of layer upon layer. It was also the era of clothing that incorporated prints with textures, as is the case with the ballet dancer sweatshirt I'm wearing here. The upper lefthand corner of the photo says January 88, so I was 8 years old here. This. Sweatshirt. Was. Everything. To. Me. I seriously loved it and never wanted to take it off. I just thought it was so unbelievably cool that unlike the dancers on either side of her, the ballet dancer in the middle had a real tutu with a genuine silk bow. 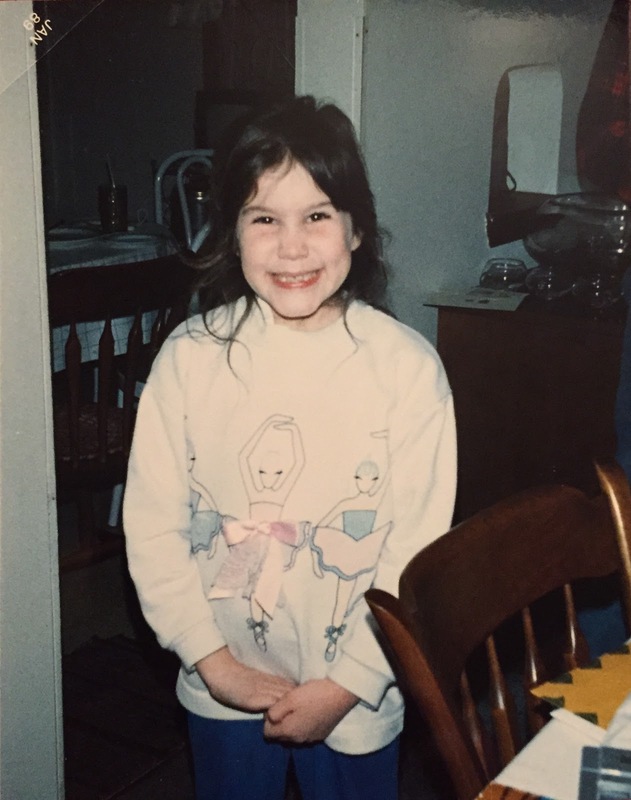 I would play with that bow and tutu absentmindedly all day long every time I wore this sweatshirt -- I think I actually did that so much that the bow eventually fell off. I would like to think, though, that I was cooler than Joan Cusack in Sixteen Candles. Look at that smile!!!!!! I can see why you loved that sweatshirt! Yeah, I think this photo definitely captures how I felt about it! you can see how happy your were to be wearing it, adorable!! haha I love that scene in 16 candles! For real tho I would totally wear that even now. Now THAT is a sweatshirt I would have loved to own! Adorable! I had one with a maid/cleaning lady whose dress and head piece was like that. It was hands down my favourite item. That is so cool Bailey! Look at you cute cute girl! That's so awesome! I had a similar shirt! !